Before I get into today's post, I just wanted to say that I went and saw Solo: A Star Wars Story this morning, and without giving away any spoilers, I really liked it. I will admit, I didn't go into this movie with very high expectations, but it was way better than I thought it would be. While I'm still not fully sold on Han, I absolutely loved Lando and the Kessel scenes. Seriously, I need more Donald Glover in my life. I really liked the characters of Rio and L3-37 (who you find makes a very lasting impression on the Falcon), I thought they were funny. No surprise, but I loved seeing how Han and Chewie became Han and Chewie. There was a small cameo at the end of a rather popular character from the prequels which I thought was great and I hope something comes out of that if they end up doing a sequel. A friend of mine mentioned how it seemed like a storyline you'd see in the comics, and I'd definitely agree with that. Overall, it was a fun Star Wars movie! If anyone else saw it, lemme know what you thought. 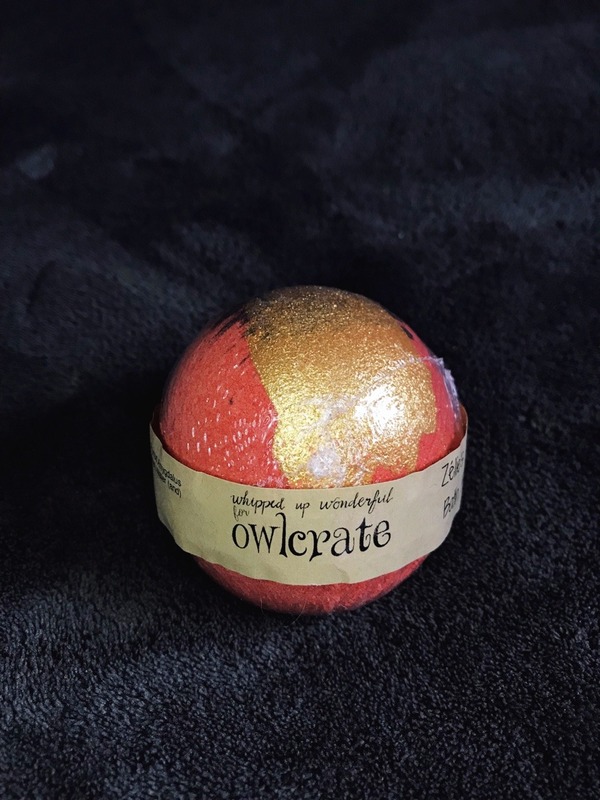 Ok, now onto this months OwlCrate. The theme was Fight Like a Girl, and it was one of my favorite boxes, so without any further ado, here we go! First up was this exclusive pin from Out of Print which Hermione would be proud to rock, that says "When in doubt, go to the library." 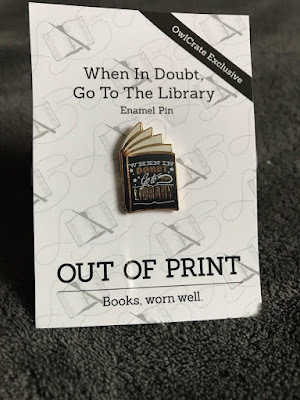 I actually already have the shirt of this, but I'm pumped to have it now in a pin as well. This bath bomb was another exclusive created by Whipped Up Wonderful inspired by the Children of Blood and Bone novel. It has a really lovely scent and I can't wait to use it. I'm not usually a huge fan of bath bombs that have glitter in them since it gets in places glitter just shouldn't go, but since it's just a strip I'm hoping it won't be too bad. 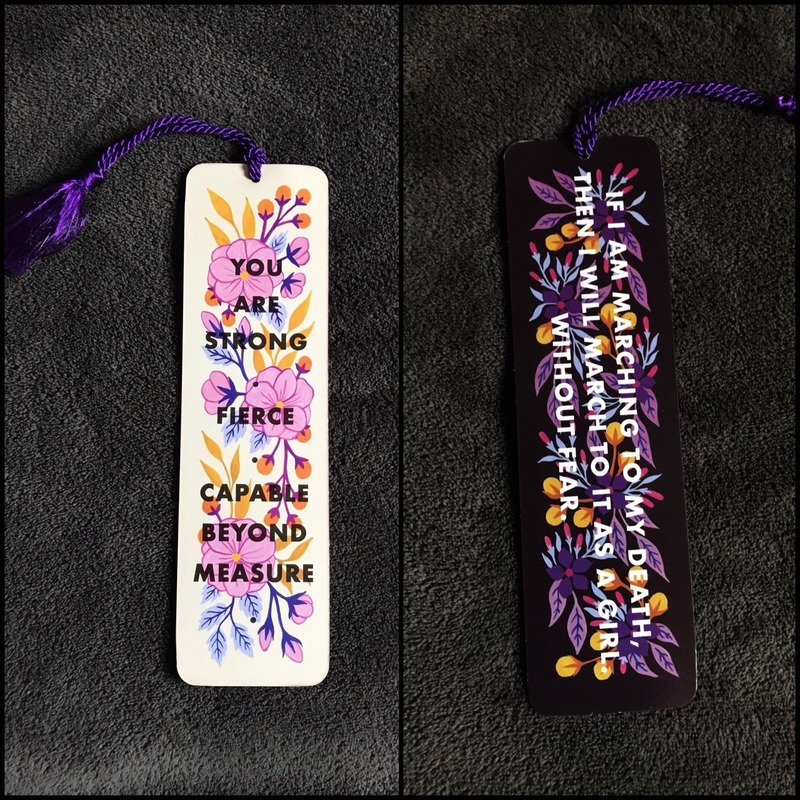 This is a double sided bookmark created by Indigo Eleven, inspired by The Wrath and the Dawn and Flame in the Mist. I love the mix of fierce quotes along with the feminine floral patterns. And I just love a good bookmark. 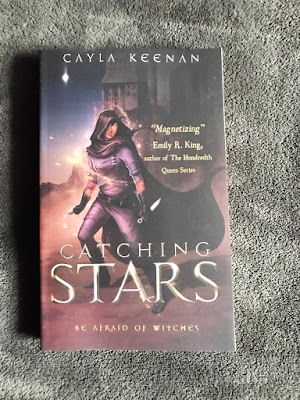 I recently re-read the Six of Crows duology by Leigh Bardugo, and you can't really have a fierce female box without including the Wraith herself! 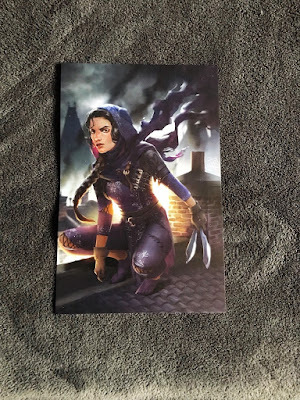 This lovely print of Inej was illustrated by Melanie Bourgeois and I just love it so much. 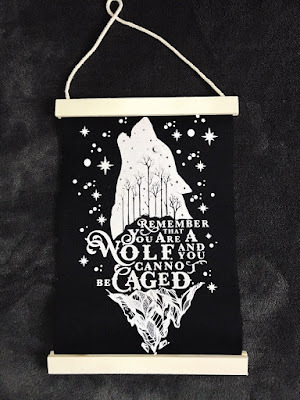 I feel like I've been talking about my love of Feyre from the ACOTAR series by Sarah J. Maas a lot, but I'm gonna gush about it even more because how gorgeous is this wall hanging by Evie Bookish?! I literally screamed, "YES!" when I pulled this out of the box because I'm just in love with it. It's one of my favorite quotes from the series and the art on it is just so great. This was by far my favorite thing in the whole box. This months box actually came with two books. 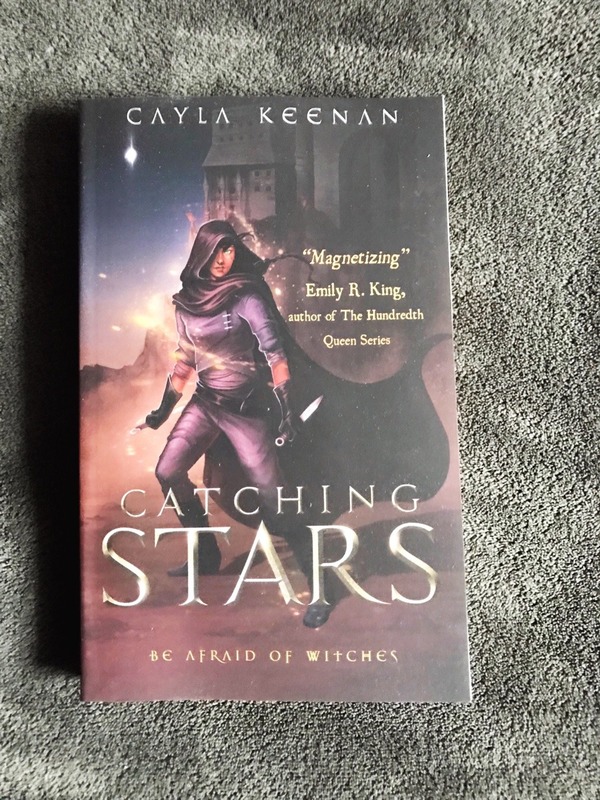 The first being Catching Stars by Cayla Keenan. This story follows a powerful witch named Jayin who's trying to survive in the grim city she calls home. She crosses paths with a man named Maddix who just escaped from being wrongfully thrown in prison, and the two become unlikely allies. They both have to learn to work together to outsmart the enemies that are around every turn. 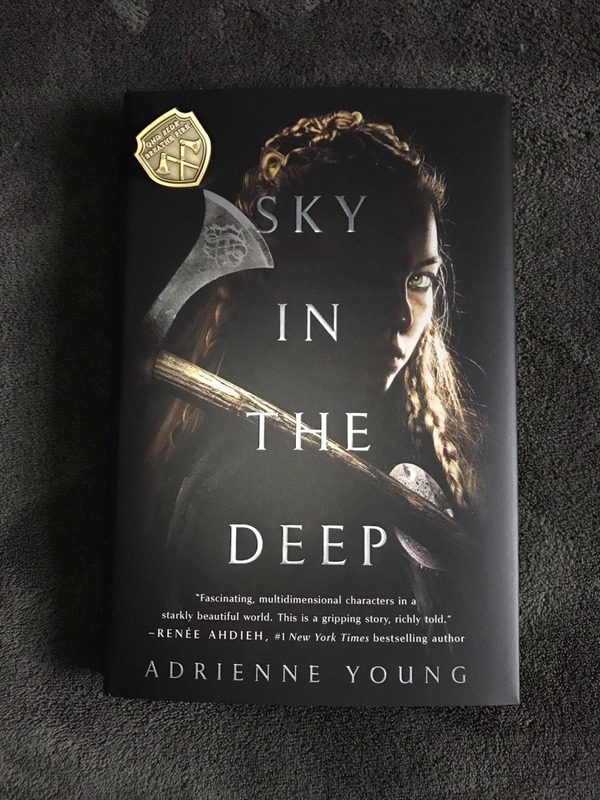 The next was Sky in the Deep by Adrienne Young. Growing up as a member of the Aska warrior clan, Eelyn's life has always revolved around two things: fighting and surviving. Loyalty to her family and clansmen is everything to Eelyn, so when she ends up facing her brother, who she thought died five years ago, on the battlefield fighting alongside the enemy, the betrayal cuts her deep. Forced into living amongst the rival Riki clan, Eelyn learns things that will change the course of her life forever. I was so hoping this would be the book included this month. I've been dying to read it since I heard about it. I mean, it has a fierce warrior woman lead character, and has all the Viking touches you could ask for. That just sounds like a recipe for perfection to me. Has anyone else read this yet? If so, lemme know what you thought! Hope everyone has a lovely holiday weekend!